This delicious beet salad comes with lessons. Fragrance doesn't roast in (as attempted Day 346). But it's easy to add later. This salad is scented with orange but lemon and lime would be good too. Well-organized bookmarks take some discipline. But when you've got cooked beets and 30 minutes til supper's expected, no worries if your bookmarks have a folder for "beets", better yet, one for "beets" and another for "cooked beets". 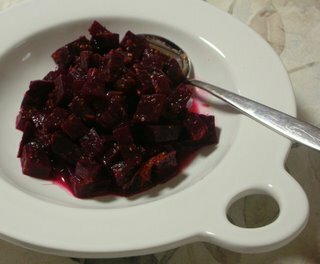 This beet recipe comes from The Flying Apple, posted way back in October. It's easy, it's good. Thank you, Angelika, for making supper's vegetable such a breeze! Start your bookmarking now! Bookmark or print this recipe only File it in Vegetables / Beets Cooked. STIR IN, SERVE & ENJOY! Yum! I have some golden beets in the fridge that will love this! Catherine - I've yet to find golden beets but am keeping my eyes peeled. Just the color captivates my attention!